Jack Bauer, how I love thee. Non-stop action and plotting wrapped up into a single day of real-time moments. Sure, I’ll suspend my disbelief a bit and pretend it only takes a commercial break to get anywhere in LA traffic. Sure, Jack is always involved and the terrorists always base their attacks in the same city. But in a full 24 hours doesn’t anyone eat anything? Seriously, just once I would like to see a character take a dump. It may surprise 24 enthusiasts that once upon a time this show was actually innovative. The first season enforced the real-time framework and the pacing, scene changes, and characters/ locations all were carefully organized to comply. The result was a damn good show that was very different from what tv viewers were used to and a hit was born. It didn’t take very long for things to break down. When you start the second season and Jack is good friends with the president it doesn’t leave a lot of wiggle room for him to believably fight the system. Wait, there’s ANOTHER terrorist who knows him? His daughter is in trouble AGAIN? Different became formulaic. The need for a cliffhanger before commercials every 6 minutes of real-time became melodramatic. I still vividly remember when 24 jumped the shark- Jack’s daughter was wandering outside somewhere and got caught in a bear trap while being stalked by a mountain lion. That’s not a joke. I don’t know why, but I think the writers just gave up. 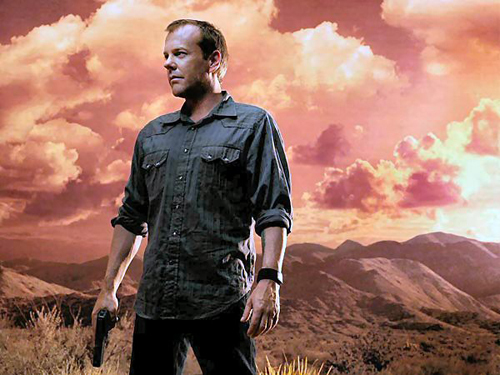 Around ‘Day 5′ I remember seeing a hype “news” story about how the new season of 24 was going to be different because Jack’s misdeeds were catching up with his conscience and he wasn’t just a cold-blooded soldier anymore. The lasting effect this “subplot” had throughout the season was a few added scenes where Jack was shaking as if about to cry. That’s that, folks, good job! The truth is, every single season of 24 after the first is the same exact story with some new characters and terrorist threats. I’m quite pleased to see that, just a few episodes into the current season, over half of these commandments are already fulfilled. And a new drinking game is born.